Corrosion-resistant swivel jack is great for marine use. Bracket height is 27" when extended, 15" when retracted. 8" Wheel turns 360 degrees so you can maneuver in any direction. Bolt-on installation with included hardware. Lowest Prices for the best trailer jack from Fulton. Fulton XLT Bolt-Thru Swivel Trailer Jack - Bolt On - Sidewind - 12" Lift - 1,500 lbs part number F141133 can be ordered online at etrailer.com or call 800-298-8924 for expert service. This jack is coated to resist corrosion, making it ideal for your boat or snowmobile trailer. The tubes and wheel assembly are coated in Fulton's Sharkskin finish. Sharkskin products undergo a test in which they are sprayed with a 5-percent salt solution to determine corrosion resistance over time. These products are able to withstand 1,200 hours of constant exposure to the saltwater mist. This 1,200-hour salt spray rating indicates that a product is not only durable enough to last in freshwater environments, but it can also be used on trailers that come into contact with saltwater. Sharkskin finish is also self-healing, meaning that it minimizes the effects of any scratches that may occur. As a result, this jack will retain its like-new appearance for longer. In addition, the jack's acme screw, wheel assembly lock nut, and grease fittings all have Fulton's ZMax finish. This clear zinc coating offers a 600-hour salt spray rating, which is also great for marine use. WARNING: This product can expose you to chemicals including Chromium, which is known to the State of California to cause cancer and birth defects or other reproductive harm. For more information, go to www.p65warnings.ca.gov. 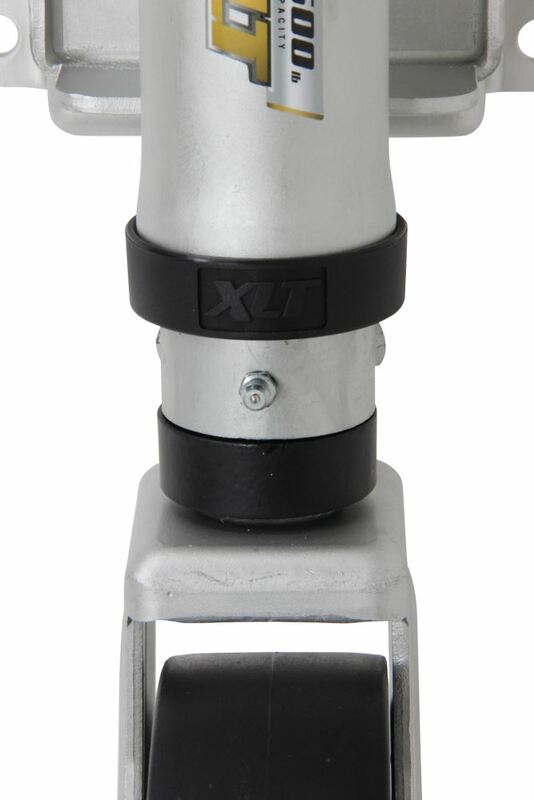 Corrosion-resistant, clear zinc swivel jack with 5-3/4" wheel is perfect for marine use as well as other recreational applications. Jack has an extended height of 23-1/2", a retracted height of 13-1/2", and a capacity of 1,000 lbs. This Dutton-Lainson sidewind swivel jack is a back saver when hitching and unhitching loaded trailers. The heavy-duty D-L tongue jack reduces the effort required to maneuver a trailer into hitching position or to remove the trailer from a vehicle. Maintenance-free, corrosion-resistant jack is made for marine, recreational and utility trailers. Features aluminum alloy construction, adjustable mount and swivel system and wide-track wheels for superior stability. 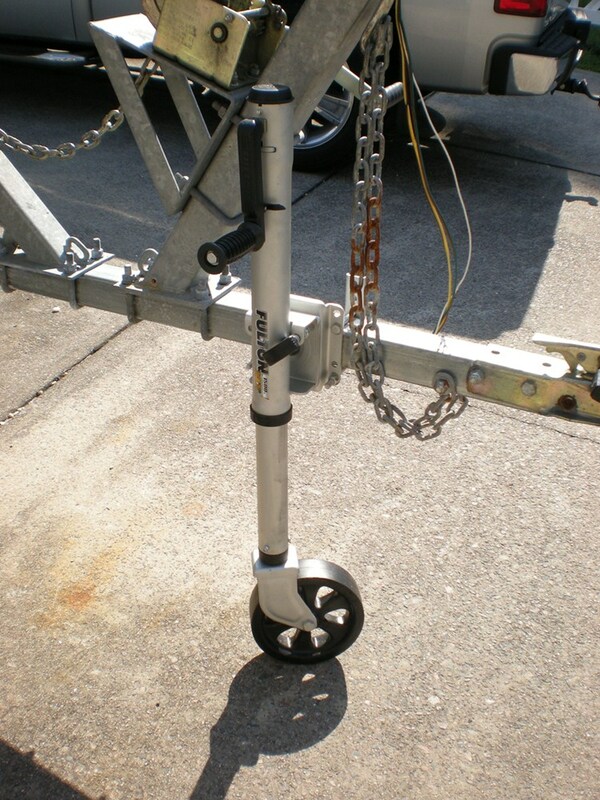 Pull Pin, Easy Swivel Trailer Jack with 6" Dual Wheels - Sidewind - 1,500 lbs. Replacement Wheel Kit for Fulton Marine Jacks - 8"
Today we're going to review part number F141133. 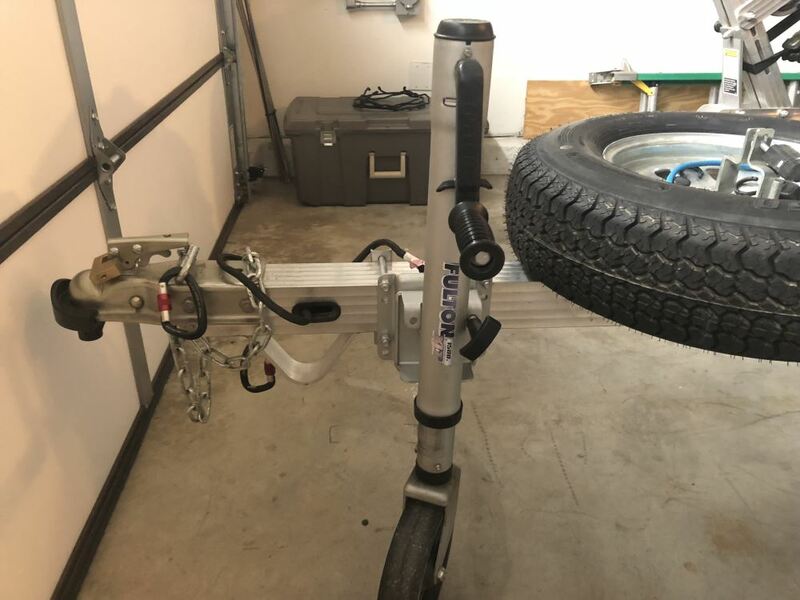 This is the Fulton XLT Swing-Away Bolt on Trailer Jack, has a 12 inch lift, is has a sidewind design and has a 1500 pound weight capacity. This maintenance free corrosion resistant jack is made from marine, recreational and utility trailers, has an upgraded speed and mobility to get you on the road quicker than the competition. The jack will raise and lower faster. Basically they do that by designing the acme screw which is the large screw in the length of the jack here that turns to let it down and up. They use a 5 pitch acme screw design versus the normal trailer jack that uses an 8 pitch acme screw and when they use the 5 pitch design, it will give you 5 turns per inch of travel. So in other words when you turn this handle 5 turns, it's going to move that jack up or down 1 inch. It's going to give you a lot quicker response, quicker speed. It's about 35% faster than the competition. Now it does include right here at the bottom the pat and pending true turn 360 system which will help when the wheel is on the ground in turning your trailer. when you turn your . swivel your jack up along side the trailer and then you just . hold up feature will hold this handle into place with the jack, it won't be hanging down. Nice little feature they've added. Now there are grease fittings on this. There's 2 right up here, one here, one here and then there's one at the bottom. One up here is to lubricate the gears, one is also to lubricate the jack screw and knot and then the one right here on the bottom will help lubricate this castering system. So basically if you keep those lubricated, this jack should last a long time. Has a nice shark skin finish which is an environmentally friendly self-healing finish. This will help provide maximum corrosion resistance and it's designed for use in salt water and other demanding environments and it has also meet the Z max 600 hours salt spray test. Now this jack has a patented. Right here you can see the bolt, XP bolt through mount swivel system. Has the F2 design pull pin which is very ergonomic, so you just pull out on this pin and you can swivel your jack up into out of the weight position. The mounting hardware, right here you can see I've installed it already, is included. The application for this is it will install on a 3 inch by 3 inch trailer frame, a 3 inch by 4 inch trailer frame and a 3 inch by 5 inch trailer frame. Now the bracket height, what I'm going to do here is let's just . I'm going to retract this all the way. There we go, just retract it. The bracket height is measured from the center of your mounting bracket down to the bottom of the caster. In this case, the bracket height on this, going to try to give you an idea here. 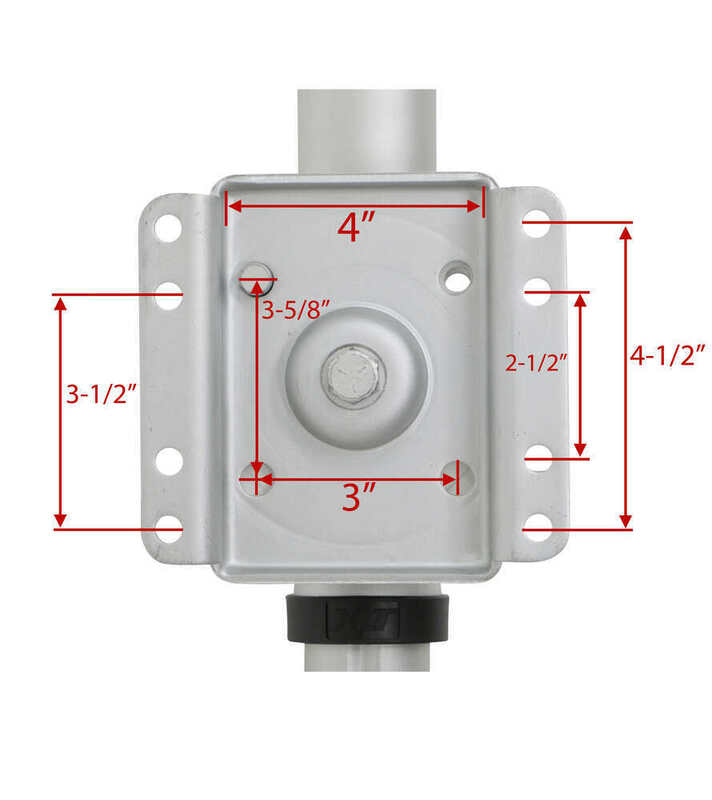 Basically from this caster to the center is going to be right at 15 inches when the jack is fully retracted and when we extend this out because it has a 12 inch lift, that measurement of the bracket height would be 27 inches. Now the lift capacity again on this is 1500 pounds. The wheel diameter is 8 inches and the width on it is 2 inches, so it gives very good stability and the pull pin diameter itself is a half inch pull pin diameter. But that should do it for the review on part number F141133. 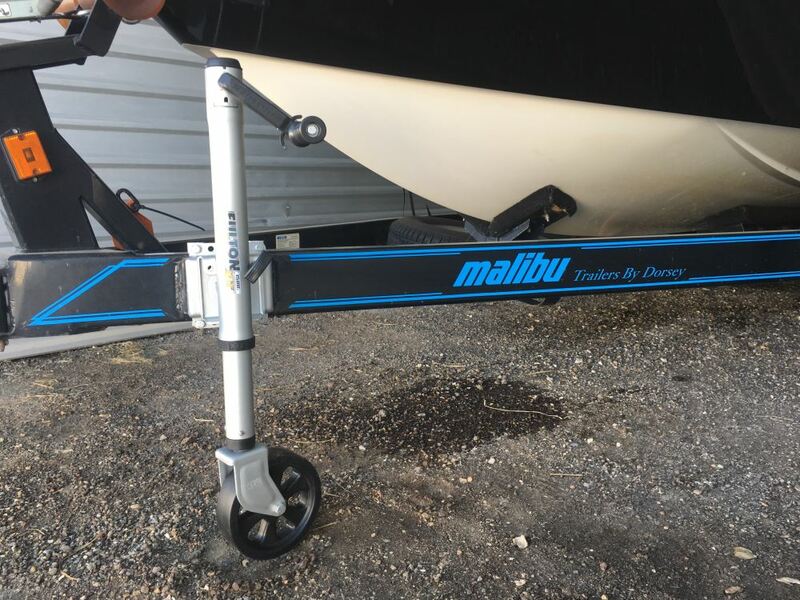 The Fulton XLT Swing-Away Bolt on Trailer Jack with the 12 inch lift, sidewind design and a 1500 pound weight capacity. .
Order: RelevanceNewestRating - High to LowRating - Low to High Corrosion-resistant swivel jack is great for marine use. Bracket height is 27" when extended, 15" when retracted. 8" Wheel turns 360 degrees so you can maneuver in any direction. Bolt-on installation with included hardware. After one year the neck is performing as good as it did day one. After 1 year, still works awesome! No maintenance and still works like new. This is a quality jack replacement and functions great! Definitely better than the original jack that came with my RangerTrail. It works great. We have a big boat. This jack handles the heavy trailer very well. The jack is still working perfectly. I originally thought this jack would be overkill for my application, but the strength of the jack makes it very easy to use. Everything about this jack is amazing, and I especially like the speed of the jack. The little plastic stop for the handle so it doesnt swing when turned up seems like an afterthought of Fulton, because it doesnt always hold, but that is a very minor problem. Etrailer was great with pricing, and customer service, and Fulton is something I would not hesitate to buy again. Well worth the higher price compared to other jacks. I have spoken with my contacts at Fulton, and this # F141133 trailer jack has their best caster and wheel combinations currently available on it, and it is designed to be highly maneuverable. It is suggested to reduce the possibility of bending or shearing the outer tube or inner tube of the jack that while maneuvering the trailer make sure that you have the jack at the lowest possible setting. This may effect the tongue weight that the loaded trailer will exert on your trailer jack, so make sure that you are within the lift capacity of this jack. Do you have a question about this Trailer Jack? It sounds like you are looking for the Replacement Hardware Kit for Fulton Swivel Jack, # F0933325S00, along with a 1500 lb jack. For your 1500 lb jack, I recommend the Fulton Bolt-Thru Swivel Marine Jack - Weld On - Sidewind - 10" Lift - 1,500 lbs, # FXP15W. This will fit with your welded mount. I reached out to my contact at Cequent, the maker of Fulton Jacks, and they let me know that the XLT Jacks, # F141132 and # F141133 are not compatible with your welded mount. Thank you for the photo of your Fulton jack. Your jack is a bolt-thru type pull-pin swivel jack. The 1500-lb-rated Fulton jack you can use in place of your existing one is part # FXP15L. 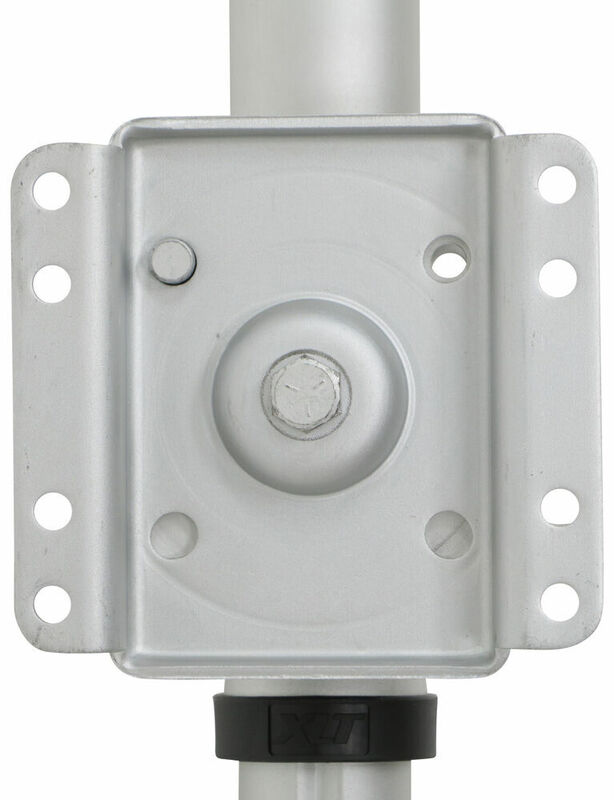 According to Fulton, their XLT Bolt On Swivel Trailer Jack # F141133 is compatible with a 3 x 2 inch trailer frame. The Fulton XLT Swivel Trailer Jack # F141133 that you referenced comes ready to be installed and used. It would not require any greasing prior to initial use. Does the welded on bracket on your trailer look like the part # P9012-00? If so, then you would want the part # F141132 for a Fulton XLT jack that would bolt right up to your trailer. If not, then you could pretty easily remove the bracket and install the # P9012-00. I reached out to my contact over at Bulldog and when looking this they confirmed that the old Ranger trailers actually used a TJ650 style jack which they don’t make anymore. In that case we recommend replacing it with a new style jack next to the existing one such as the Fulton Round, Snap-Ring Swivel Marine Jack # FTJ12000101 or the Fulton XLT Bolt-Thru Swivel Trailer Jack - Bolt On # F141133. I went out into our warehouse and pulled a Fulton XLT Jack to measure the mounting hole dimensions for you. From left to right the holes are 5-1/2 inches apart, from the very top holes to the very bottom holes the distance is 4-1/2 inches, the center set of holes are 2-1/2 inches apart and then the top two and bottom two holes are 1 inch apart. 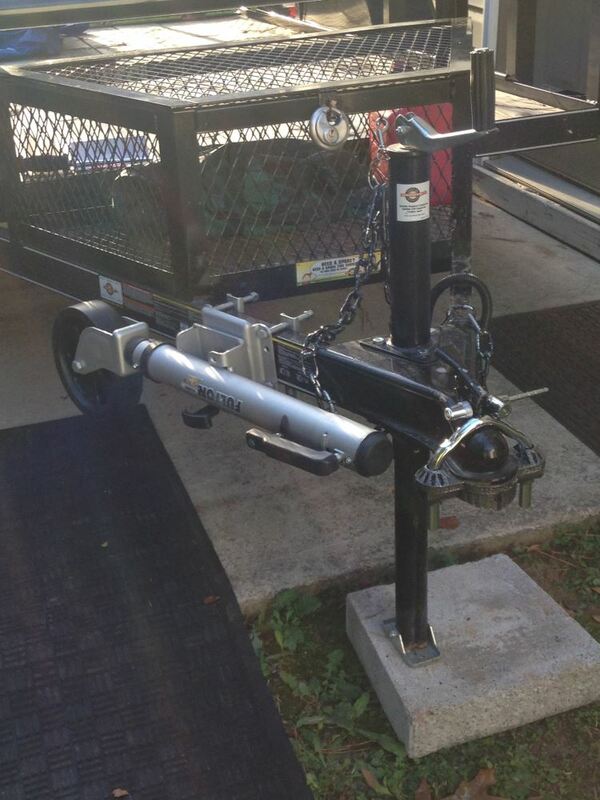 The trailer jacks we offer for a tongue trailer are all manually operated. We do not have any electric bolt-on jacks available. 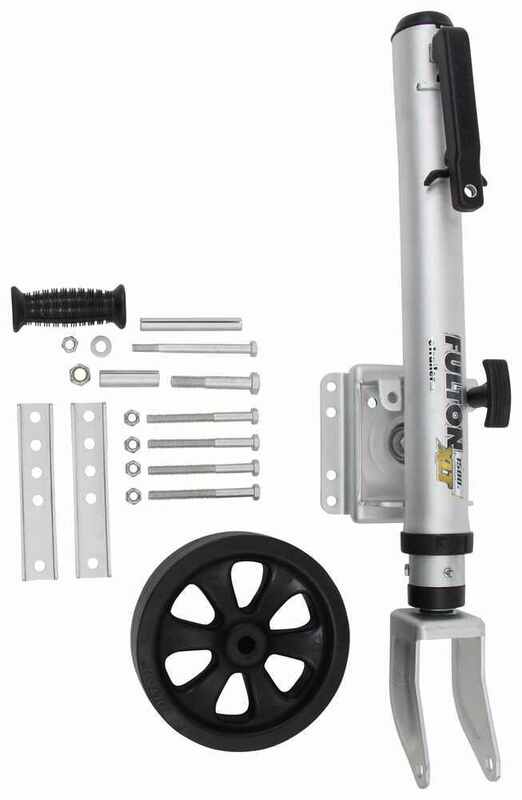 For a bolt-on trailer jack I recommend a jack like the Fulton XLT Bolt-Thru Swivel Trailer Jack, part # F141133. This is a 1,500-lb jack that bolts to a trailer frame that measures 3 x 3 or 3 x 4 inches. 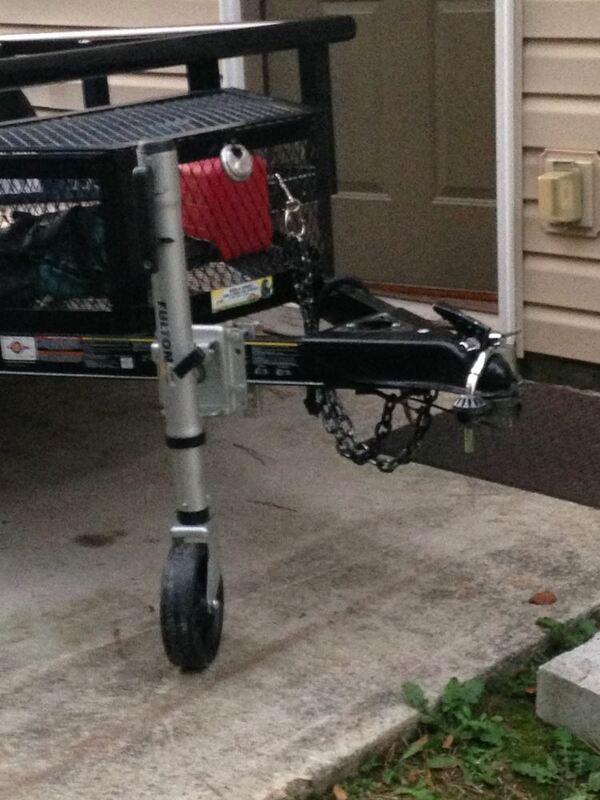 The jack swivels up to stow it parallel to the trailer frame for travel. The Fulton XLT Swivel Trailer Jack part # F141133 that you referenced would be a great solution for what you are looking for. It has a larger caster wheel which makes rolling the trailer around easier and can swivel up when not in use to get out of the way and not cause ground clearance issues. The diameter of the Replacement Pull Pin for Fulton XLT Swivel Trailer Jacks # F500365 is 1/2 inch. This is designed to fit the Fulton XLT trailer jack part # F141133. The Shelby trailer jack 5876 is a side-wind pull-pin side-frame-mount caster wheel swivel jack that bolts on to a trailer frame. We do offer plenty of options but the one that I often recommend for value is Fulton's 1200-lb-rated jack # FTJ12000101. This fits frames up to 3 x 5-inches. If you prefer the admittedly much nicer 1500-lb-rated XLT jack # F141133 just make sure your frame is either 3 x 3 or 3 x 4-inches. You can use the Fulton F2 Swing-Up Trailer Jack with Dual 7-Inch Wheels, part # F1413100334, which mounts to a weld-on plate # F500277. If this is the plate on your trailer you're all set; if not please give the mounting hole spacing from your plate so we can find a compatible jack for you. Highest quality trailer jack for the best price. Most detailed, accurate trailer jack information available.